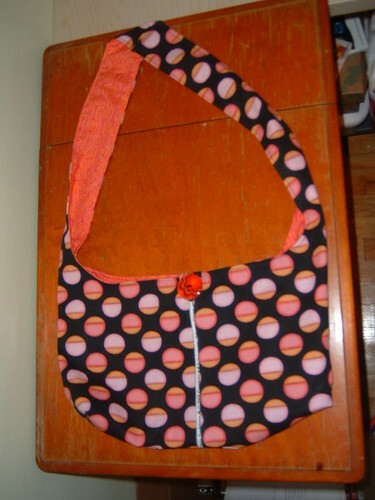 another purse, originally uploaded by Craftydiddl. Little Man has a another cold 😦 so after getting sneezed on again and this time yelling to cover his mouth and nose i am sure to be covered in germs. i can only hope the Tea and Airborne i have been taking all day are helping. I hate the cold season. Tune back in in Spring and Summer i will be back to whine about allergies. Finally my camera. Boy is it pissin me off!! Last Saturday we went to the fire station for an Open House. They had lunch, a smoke house demonstration, balloons, face painting, and a fake house with fake flames the kids could shoot the fire hose at. Anyway back to the point, Little Man got Sponge Bob on his face. As soon as we got home he decided it must come off. I wanted to take a picture before we washed it off so i hurried and got the camera. Turned it on, focused was just about to push the button and Bzzzp it turned off. I turned it back on again….Bzzzzpp it turned off. Okay i thought, battery must be dead. Got new batteries, turned it on…Bzzzpp it turned back off. I tried 2 more sets of batteries and finally i got a shot of his cheek. It worked for 2 days i think and then Bzzzpp it turned off again and it was always right when i had aimed and was ready to take the shot. Like it Knew. Stupid camera. I left it alone and later it was fin again. Next day it was fine-Tuesday for Robot’s first attempt at pics i got the bad couch shot but then Little Man wanted to have his picture with Robot-Yep you guessed it–I aimed and BBZZZPPPP it turned itself off. 2 hours later was working fine. Today i wanted a picture of my purse–Have you figured out the pattern yet? Aimed and Bzzzzppp!!!!!!!! ARRGGGGHHHHHHHHHHH!!!!!!!!!!!!!!!!!!!!!!!!!!!!! STUPID F——-n CAMERA. A few hours later it was fine. WHY? WHY? WHY? Does my camera not know that we are poor right now, we are saving for a big trip. Does my camera not realize this is a bad time to be falling apart!! i have looked online and apparently i am the only one with a stupid camera that does this. either that or people just figured that their camera was dying and got a new one OR the got new ones before theirs showed this bad bad camera illness. okay okay I will admit my camera is about 4 and half years old but that shouldn’t matter-i just need him to last a few more months. i emailed the site and also found a camera repair place in the area so depending on what the camera site tells me back i am going to look into possibly fixing him-if it is even fixable. LOL you know as mad as it makes me i just have to laugh-things always fall apart at important moments. On a happier note-i am coming close to finishing my cardigan-i cast off on the body last night and started an arm today. After this i am going to do a swatch for THISso i can buy some yarn tomorrow at the craft store. We didn’t go today since Little Man was sick. Which was quite nice-all we did was lay around. I don’t think i am going to make it as long as in the picture but we’ll see as it progresses. Ooh you are going to make the jumper dress! @ Traveling Teddy – Please be sure you e-mail Anna at the website with all your contact info and the other items. There does seem to be a few others in front of you so I am not sure how soon TT will get to you. You are starting that dress already! Good for you, I’m still knitting my Lucinda cardigan, not much progress lately but I have some plans for this weekend. I’m sorry about the camera problems, it may be the time for the new one but I know that it’s not an easy purchase. Let’s hope it is fixable! I hope little man feels better and that you don’t catch his cold! Also I hope your camera will be OK. We had camera issues this summer and it was caused by humidity and eventually cleared up on it’s own.